Rhubarb Pie – Dee's Favorite! Rhubarb Pie – Dee’s Favorite! Dee continues her series of Rhubarb, sharing this recipe. See her previous posting about rhubarb and its story. Prepare your own pie crust for two 9 inch pies – bottom crusts only. Sift together flour, salt and sugar in a bowl. In a separate bowl mix egg, sour cream, vanilla and pie filling. 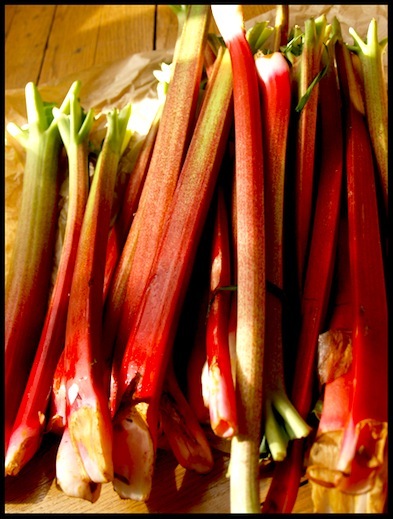 Cut rhubarb into small pieces and put half into each of the uncooked pie shells. Pour the combined ingredients evenly over the rhubarb. Prepare topping and cut in butter until crumbly. Set aside. Bake pies at 400 degrees for 15 minutes then reduce heat to 350 for 20 more minutes. Remove from oven and sprinkle topping over the pies and return to oven for an additional 15 minutes. Use caution when filling the pie plates. This pie will bubble over if you over-fill the pie plate. I love Rhubarb Pie too. My mother makes an awesome rhubarb pie, but I look forward to trying yours with the sour cream, Dee. Thanks for sharing!